Some people are prepared to travel along way to their favourite casinos and the new Mars Casino will take you all the way to outer space. The casino is offering games from some top developers such as BetSoft Gaming, Microgaming, Net Entertainment, SoftSwiss, Endorphina and many more. Thanks to this there is a huge number of games on offer befitting of a casino located on Mars. There is a vast collection of online slots including classic, video and progressive titles built on many different themes. Members can also play card and table games, video poker titles, arcade games and enjoy a live dealer casino. 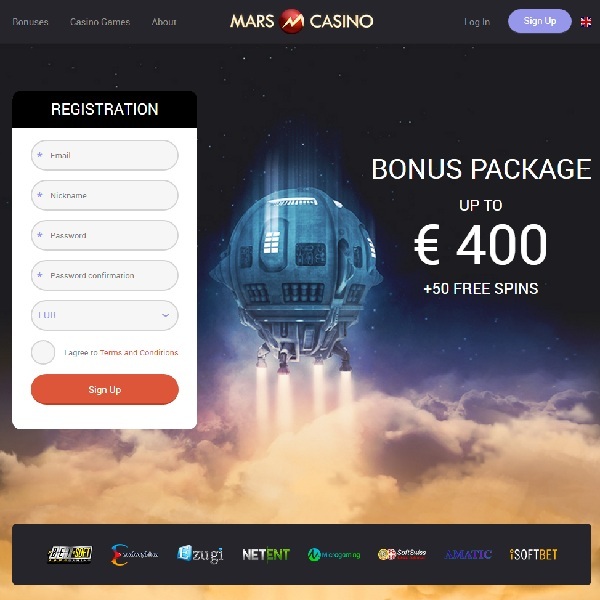 New members of Mars Casino will receive a 100% first deposit bonus of up to €150 with 50 free spins. There is a 25% second deposit bonus of up to €100 and a 50% third deposit bonus of up to €150.